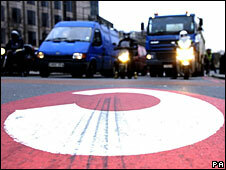 The planned emissions-linked congestion charge will result in an increase in carbon dioxide (CO2), a study shows. King's College experts predicted a rise in CO2 levels in outer London would outweigh the benefits of CO2 saved by the £25-a-day fee in inner London. Researchers said this would be largely caused by people driving further to avoid the congestion charging zone. Transport for London (TfL), who commissioned the report, said King's College's methodology was inaccurate. London's mayor, Ken Livingstone, plans to raise the daily charge from £8 to £25 from 27 October. Under the plans the cars emitting the highest amounts of CO2 will have to pay a £25 congestion charge whereas cars with the lowest emissions will get a 100% discount. The environmental impact report was released after a request from carmaker Porsche, which is seeking judicial review to stop its introduction. Porsche claims the "unjust" charge will unfairly hit large numbers of drivers in London and undermine London's attractiveness as a place to do business. Andy Goss, managing director of Porsche Cars GB, said: "We always knew the environmental impact of this unfair tax would be minimal, now we know it will make matters worse." According to the King's College report, the new charge will create a "very high disbenefit" for CO2 and other components crucial for air quality. Research revealed there would be an increase in CO2 emitted in Greater London year-on-year from 2009. It showed that by 2012 the increase in CO2 in outer London would be almost 184,000 tonnes, with just 2,200 tonnes saved in central London, giving an overall increase of 182,000 tonnes. The report concluded that because of the new charge, drivers were likely to increase their mileage outside of, and around, the zone and thus increase their emissions. A spokesman for TfL said: "While King's College provided comments on the impact of CO2, the methodology used is less robust and accurate than TfL's methodology. "Our methodology shows that the CO2 Charge will cut emissions from cars travelling to and from the zone by up to 5,000 tonnes in 2009. "King's College, who undertook this modelling, agree with this conclusion and are currently revising their report."